U.S., Israel gave Abbas the chance, supported him to smash opponents in his own Fatah party, but what was the outcome? 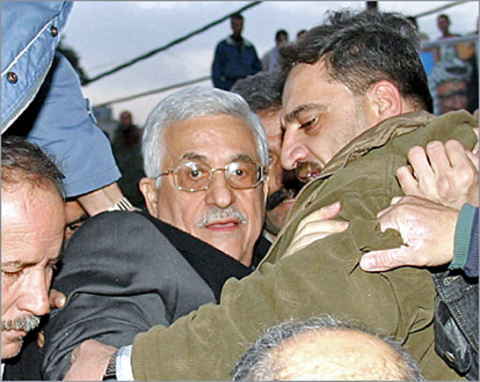 “CAN ABBAS be saved?” asked Uri Avnery on June 25, 2007. “I don’t know.” he answered, “Some of my Palestinian friends are in despair. They grew up in Fateh, and Fateh is their home. They are secularists. They are nationalists. They definitely do not want a fanatical Islamic regime in their homeland. starved Gazans for electing Hamas. Hear it from Uri. On September 14, 2009, Uri wrote, Barack Obama, Binyamin Netanyahu and Mahmoud Abbas – All three of them – “are fighting for their political life. The three battles are quite different from each other, yet interconnected.” The three battles are still ongoing and still interconnected. “Behind the scene, there is a domestic political imperative behind Abbas decision. Yes, he wants to seek a statehood, but he is also planning his own political survival. For many years, Abbas watched his popularity plummet among the Palestinian public. Many viewed him as a collaborator who only maintain Israel security. Netanyahu made things even harder, his refusal to renew the moratorium on settlement building in the West Bank has led to the final breakdown of the direct negotiations. By opting to go outside the framework of the Oslo accord, Abbas would probably be able to regain his popularity among the Palestinians, snooker the Israelis and US and most importantly score a few points against Hamas…. Uri, rejoice, but the wise speech of yoyr “tragic hero”shall not stop the water rising slowly and silently behind the dam, until it burst, sweeping the illustion of possible peace with Zionism. 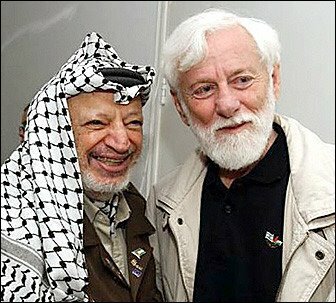 Uri Avnery compares Palestinian President Mahmud Abbas’s gamble in making a bid for Palestinian statehood at the United Nations – and thereby putting Palestine at the centre of world attention – with Barack Obama’s sheer unprincipled prostitution in the service of Israel – all for the sake of a second term as president. A wonderful speech. A beautiful speech. The language expressive and elegant. The arguments clear and convincing. The delivery flawless. A work of art. The art of hypocrisy. Almost every statement in the passage concerning the Israeli-Palestinian issue was a lie. A blatant lie: the speaker knew it was a lie, and so did the audience. It was Obama at his best, Obama at his worst. Being a moral person, he must have felt the urge to vomit. Being a pragmatic person, he knew that he had to do it, if he wanted to be re-elected. In essence, he sold the fundamental national interests of the United States of America for the chance of a second term. Not very nice, but that’s politics, OK? It may be superfluous – almost insulting to the reader – to point out the mendacious details of this rhetorical edifice. Obama treated the two sides as if they were equal in strength – Israelis and Palestinians, Palestinians and Israelis. But of the two, it is the Israelis – only they – who suffer and have suffered. 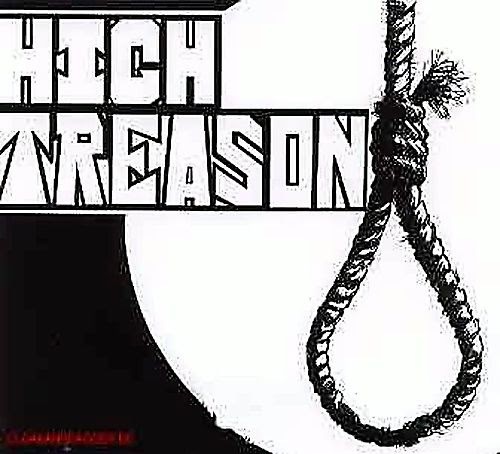 Persecution. Exile. Holocaust. An Israeli child threatened by rockets. Surrounded by the hatred of Arab children. So sad. No occupation. No settlements. No June 1967 borders. No Nakba. No Palestinian children killed or frightened. It’s the straight right-wing Israeli propaganda line, pure and simple – the terminology, the historical narrative, the argumentation. The music. The Palestinians, of course, should have a state of their own. Sure, sure. But they must not be pushy. They must not embarrass the US. They must not come to the UN. They must sit with the Israelis, like reasonable people, and work it out with them. The reasonable sheep must sit down with the reasonable wolf and decide what to have for dinner. Foreigners should not interfere. Obama gave full service. A lady who provides this kind of service generally gets paid in advance. Obama got paid immediately afterwards, within the hour. Netanyahu sat down with him in front of the cameras and gave him enough quotable professions of love and gratitude to last for several election campaigns. The “plucked chicken” is soaring into the sky. 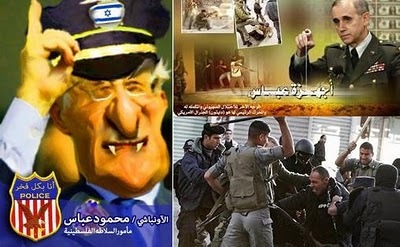 The tragic hero of this affair is Mahmoud Abbas. A tragic hero, but a hero nonetheless. Many people may be surprised by this sudden emergence of Abbas as a daring player for high stakes, ready to confront the mighty US. If Ariel Sharon were to wake up for a moment from his years-long coma, he would faint with amazement. It was he who called Mahmoud Abbas “a plucked chicken”. Yet for the last few days, Abbas was the centre of global attention. World leaders conferred about how to handle him, senior diplomats were eager to convince him of this or that course of action, commentators were guessing what he would do next. 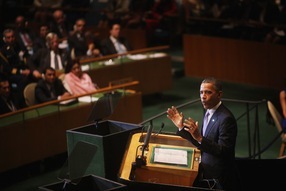 His speech before the UN General Assembly was treated as an event of consequence. Not bad for a chicken, even for one with a full set of feathers. His emergence as a leader on the world stage is somewhat reminiscent of Anwar Sadat. When Gamal Abd-al-Nasser unexpectedly died at the age of 52 in 1970 and his official deputy, Sadat, assumed his mantle, all political experts shrugged. Sadat? Who the hell is that? He was considered a no-nentity, an eternal No. 2, one of the least important members of the group of “free officers” that was ruling Egypt. To the utter amazement of the experts – and especially the Israeli ones – this “non-entity” took a huge gamble by starting the 1973 October War, and proceeded to do something unprecedented in history: going to the capital of an enemy country still officially in a state of war and making peace. 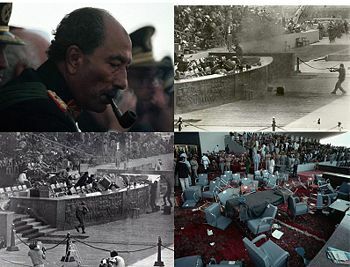 Abbas’ status under Yasser Arafat was not unlike Sadat’s under Nasser. However, Arafat never appointed a deputy. Abbas was one of a group of four or five likely successors. The heir would surely have been Abu Jihad, had he not been killed by Israeli commandoes in front of his wife and children. Another likely candidate, Abu Iyad, was killed by Palestinian terrorists. Abu Mazen (Abbas) was in a way the choice by default. Such politicians, emerging suddenly from under the shadow of a great leader, generally fall into one of two categories: the eternal frustrated No. 2 or the surprising new leader. The Bible gives us examples of both kinds. The first was Rehoboam, the son and heir of the great King Solomon, who told his people: “my father chastised you with whips, but I will chastise you with scorpions”. The other kind was represented by Joshua, the heir of Moses. He was no second Moses, but according to the story a great conqueror in his own right. Modern history tells the sad story of Anthony Eden, the long-suffering No. 2 of Winston Churchill, who commanded little respect. (Mussolini called him, after their first meeting, “a well-tailored idiot”.). Upon assuming power, he tried desperately to equal Churchill and soon embroiled Britain in the 1956 Suez disaster. To the second category belonged Harry Truman, the nobody who succeeded the great Franklin Delano Roosevelt and surprised everybody as a resolute leader. Abbas looked like belonging to the first kind. Now, suddenly, he is revealed as belonging to the second. The world is treating him with newfound respect. Nearing the end of his career, he made the big gamble. But was it wise? Courageous, yes. Daring, yes. But wise? My answer is: yes, it was. Abbas has placed the quest for Palestinian freedom squarely on the international table. For more than a week, Palestine has been the centre of international attention. Scores of international statesmen – and women – including the leader of the world’s only superpower, have been busy with Palestine. Oppression shuns the limelight. Occupation, settlements, ethnic cleansing thrive in the shadows. It is the oppressed who need the light of day. Abbas’s move provided it, at least for the time being. Barack Obama’s miserable performance was a nail in the coffin of America’s status as a superpower. In a way, it was a crime against the United States. Now he has blown it, perhaps forever. No self-respecting Arab will forgive him for plunging his knife into the back of the helpless Palestinians. All the credit the US has tried to gain in the last months in the Arab and the wider Muslim world has been blown away with one puff. It was also a crime against Israel. Israel needs peace. Israel needs to live side by side with the Palestinian people, within the Arab world. Israel cannot rely forever on the unconditional support of the declining United States. Obama knows this full well. He knows what is good for Israel, even if Netanyahu doesn’t. Yet he has handed the keys of the car to the drunken driver. The state of Palestine will come into being. This week it was already clear that this is unavoidable. Obama will be forgotten, as will Netanyahu, Lieberman and the whole bunch. Mahmoud Abbas – Abu Mazen, as the Palestinians call him – will be remembered. The “plucked chicken” is soaring into the sky. Mazin is optimistic, Abbas would “now implement quickly the reconciliation agreement…would act quickly and decisively to really promote popular unarmed resistance throughout Palestine.” In other words, Hamas and resistance factions should willingly lay arms or othetwise.